Just got hooked on MonkeyBrains. They need your help though — contact you Supervisor and tell them to make it easier for local ISPs like Monkeybrains to get permits to build fiber networks to the home and provide real competition to Comcast and AT&T. Yes! I highly, highly recommend MonkeyBrains! Those guys are the best! Second the MB recommendation…been with them for 4 months now and and couldn’t be happier. Bye bye AT&T! Alex & Rudy rock. Malia Cohen just heard from me. Is that wireless then? And a business account? How much are they charging for business? Totally. Bernalwood is powered by MonkeyBrains as well. Broadband for locavores. Been using monkeybrains since april. I’m very disappointed. 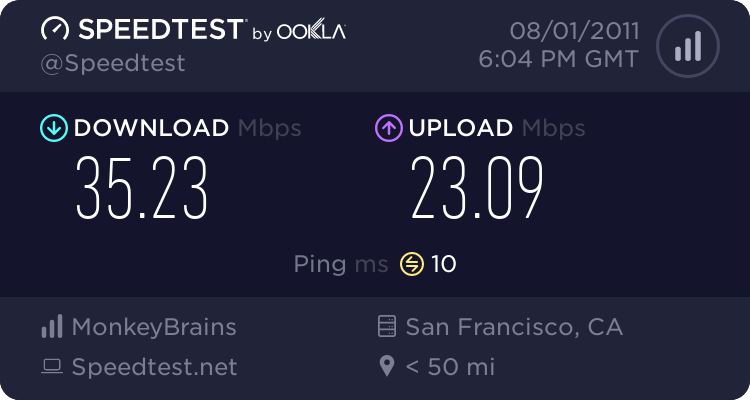 My speeds are in the 8 range. they dropped of like a rock as soon as the 3 month free period was over. Weird. Have you talked to them? It could be that your antenna has gone slightly off target and needs to be re-aimed at the next one? “permits to build fiber networks to the home”? WTF?!? 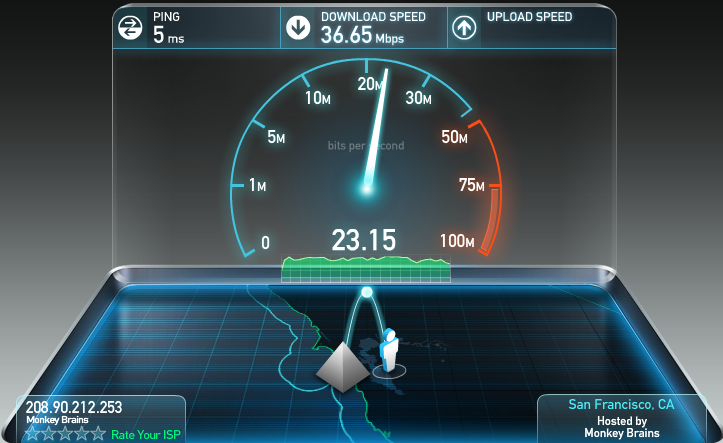 The ISPs need to get f**ing PERMITS to build fiber? No wonder we’re a century behind Korea! Relying on the government to regulate the internet is the stupidest thing ever. This is the internet we’re talking about! Building a few boxes on city blocks is well worth it to get fast, 21st century internet infrastructure, and the old geezers who think otherwise (especially those in the government) need to hurry up and die so we can continue progressing! It’s harsh, but true. The train of progress can’t be stopped. Either get on it, or get run over.